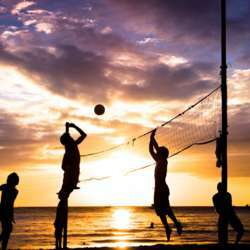 You must be a member of the Singapore Beach Volleyball Group to attend this activity. Would you like to join this group? IMPORTANT: Please RSVP only if you are sure that you will turn up. Event will carry on even if wet weather. 1. This event is for both Advanced Players and Beginners, who are keen to learn it. Depending on the skill level and the number of players we play 2 vs 2 and/or 3 vs 3 across one, two or more courts. 2. We USUALLY are a LARGER GROUP of Protected content of various skill levels, i.e. more than those registering here. Most of the regular players do not register here any longer. The event is on, even if there is only one person signing up on Internations. 4. There are showering facilities at Protected content We recommend you to bring your own towels and fresh clothing. 5. Please bring along your swim wear, if you intend to chill by the pool side lounge after the game.